As we ring out 2009 and the first decade of the current millenium, it is useful to take stock of where we are. Certainly, by almost any measure, the last couple of years have been exciting ones for the nuclear industry. After a long period of stagnation in many parts of the world, the past new years have seen 1) a high expectation for new orders by a number of utilities in the United States, 2) significant expansion of nuclear power programs by China and other countries, 3) indications of interest by several dozen countries that have never had nuclear power, 4) a turnaround by several countries that had phased out nuclear power or were planning to, and 5) a great improvement in public perception towards nuclear power in the US and around the world. 1. We should not count our chickens before they hatch. I don't think any of us really expect that every expression of interest will result in new power plants. We would all be happy to see a fraction of the current possibilities realized. However, if we crow about the numbers too much, others will perceive it as a failure when some of the potential orders inevitably drop off. 2. We should not rest on our laurels. Getting people interested in nuclear power is not the hard part. After all, its very real benefits should sell themselves. Delivering is the hard part. We need to make sure the new round of projects succeed. 4. We should provide the public with simple, but reasoned--and accurate--arguments. I realize that the opposition engages in industrial character assassination--often supporting their opposition to nuclear power with seemingly concrete numbers that have little substance behind them. I realize that we are told that engineers fall into the trap of TMI--here meaning "too much information"--all too often. However, we are not going to win the public over by simply copying the same tactics others use. They have already gained some traction. We really have to refute those arguments--but in terms the public can understand. And, even more important, we have to present our own case--again, clearly, simply (but not simplistically), and most of all, accurately. 5. We should not fight ourselves. Of course, we all think the particular technology we are working on is the best one, and when I am not hearing about nuclear versus renewables, I seem to hear nuclear people bad-mouthing each other's technologies. Areva versus GE plants, small versus large plants. There are likely markets for multiple options, so we should not focus on any one option. Rather, we should work together to give all the options a chance in the marketplace. 6. We should face our own faults, and do something about them. Truly, we have had many bumps in the road to nuclear power development in the past. Many of them were due to reasons outside our control. Others were hard lessons learned, but we think we have learned them. Still, we continue to see cost overruns and schedule delays. We usually explain those away--at least among ourselves. It is my observation that, outside our community, people aren't buying it. Even if there is a good reason every time, we have stumbled so many people don't trust our cost and time projections any more. I know this is easy to say and hard to do, but we have lost credibility in this arena, and we need to gain it back. We need either to provide more convincing justification for why some of the recent problems were truly out of our control--or better still, we need the first few new projects to be success stories. 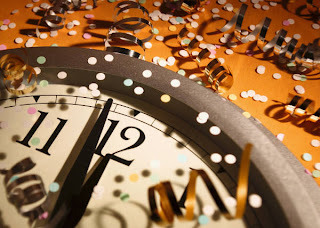 And with those thoughts in mind, a happy, healthy, prosperous New Year--and new decade--to all! I viewed with mixed emotions the recent news that Diane Feinstein is introducing legislation to protect a million acres of the Mojave Desert from construction of solar and wind power plants. On the one hand, it is occasionally nice to see some technology other than nuclear power picked on. On the other hand, if you can't put solar collectors in what is arguably the ideal location for them, what are our prospects for accomplishing anything? I'd welcome any additions if anyone knows of other such acronyms/initialisms of either persuasion. More than that, but tougher, it would be nice to find a solution to this growing problem, but I'm afraid that will be far more difficult. Is There a Win-Win in the Financial Commitments? I will leave it to others to analyze the success or failure of the Copenhagen conference. However, now that the dust has begun to settle, I want to focus on one issue that I think did not get enough attention during the conference--that is, the issue of how the financial support from developed countries to developing countries can be implemented. Even here, I don't want to address the entire issue of financial support. I do not want to debate whether it is a wealth-transfer mechanism, and if so, how much money the developed countries should pay and whether China should be a beneficiary. These are truly important questions, but I have no special insight to offer. The neglected area that I want to address is whether we can make the financial commitment--whatever the amount and whatever countries are involved--work for the developed countries as well as the developing countries. In particular, it seems to me that we can use the financial assistance we provide to developing countries to benefit the industries of the developed countries at the same time. Rather than handing out money--which sometimes results in disastrous misuse of funds anyway--shouldn't the governments of the developed countries purchase products from their domestic companies and send those products abroad? Shouldn't money provided by the US be used to put US technology in the developing countries, whether that technology is nuclear power plants, or solar collectors, or windmills? I would think the populations of the developed countries should view the demands of the developing countries far differently if the financial support is structured so that it also contained an opportunity for us to foster the development and growth of new domestic energy-supply industries. And it might also help change the viewpoint of China, which would like to be a supplier nation. True, the financial support the developing countries want must cover costs other than hardware alone, so the entire package cannot be spent this way. Still, a large fraction of it could be. And true, the developing countries will want to develop some of their own capabilities. This idea doesn't preclude that possibility, but that may come later and through different mechanisms. If the developing countries are truly serious that they need financial support to help them reduce their emissions, then they should welcome the chance for a quick start using technology from developed countries. And they should realize that it is still the developing countries that are going to suffer the most from climate change in the years ahead. I can conceive of several different ways a financial program such as this might be implemented, each of which may have some pros and cons. However, the first step is for the developed countries to recognize the opportunity that should exist in the "demands" from the developing countries and to proceed with that thought in mind in further discussions on this subject. We all applaud the ambitious Chinese nuclear power development program, which is breathing new life and new energy into the prospects for nuclear power worldwide. But amidst the rejoicing, we have to worry just a little. In the safety arena, we are fond of asking, "How much is enough?" For rapidly escalating new-build programs, an appropriate question might be, "How much is too much?" A recent New York Times article spelled out some of these concerns. China has acknowledged it doesn't have a sufficient inspection force and has asked for help. China has a recent history of scandals in the food, drug and toy manufacturing industries. There is an ongoing corruption scandal in the China National Nuclear Corporation, and an apparent attempt to hush it up. I don't think all is lost. I participated in one of the early trips to China after it began to open up to the West. 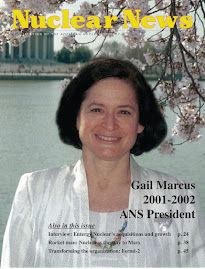 In 1983, I went to China with an American Nuclear Society delegation to discuss with them their plans--at the time--to start their first nuclear power plant. I recall being worried when I discovered the poor maintenance in some of the hotels in which we stayed. I was particularly concerned that the plumbing in my hotel rooms didn't always work. What was a reactor, I thought, if not a lot of plumbing? 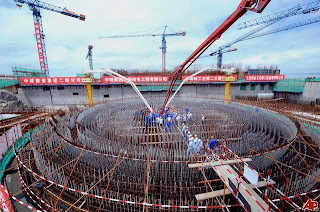 As it turns out, the performance of Chinese reactors has so far met world standards. I can probably conclude that the Chinese put their best efforts in the most critical areas. I can also attest to the fact that the hotel plumbing worked a lot better on my second trip to China. Yet, the idea of a rapid ramp-up remains worrisome. What will happen if the inspection ranks are spread too thin? Will they really slow progress, or will they do a cursory inspection and cross their fingers? Will the culture that seems to pervade other industries take hold in the nuclear power area? As much as we might applaud the ambitious aims of the Chinese, it behooves us all to make sure that the goals don't obscure the need for careful attention to detail in the construction and operation of these plants. I'd rather see the Chinese program move forward more slowly if that would help avoid the kind of misstep that could stop the progress of nuclear power elsewhere in the world. It seems that one of the big hangups at the Copenhagen conference which is now in its final days is the demand by the developing countries for financial support from the developed countries. I have been watching this debate with growing concern. Without getting into the arguments for and against this demand, it does seem to me that there are some areas in which support from the developed countries can be a win-win. This might be one of them. Selected assistance to China to help it increase its regulatory force would be a small price to pay if it helps assure that the Chinese plants are built and operated to the highest standards. Active involvement by developed nations might also help assure that the safety culture that seems to be operative in the Chinese nuclear industry so far is retained and strengthened. Recent revelations about the alleged fabrication of data on global warming have raised high-profile objections to US participation in the Copenhagen climate change conference. This would be an unfortunate reaction on many levels. Of course, the recent discoveries of possible fraud are disappointing and we need to understand what the facts really are. However, the discussions do not need to stop while the incident is being probed. While the initial trigger for the Copenhagen conference was the growing concern worldwide about global warming, global warming is only one reason that we should be engaged in an international dialogue on energy and environment. I'm not a climatologist. Then again, neither are most of the people who are denying the reality of global warming. So we're on equal ground. While I can't claim I fully understand all the climate models, I understand that the global environment is incredibly complex. It is therefore difficult to extrapolate long-term global trends from a few years of data or data from a small part of the globe. What is compelling to me is not any single study or model or set of data, but the fact that, in recent years, I have seen a lot of different kinds of data that suggest that there are already effects warming trends occurring--Arctic ice melting, changes in insect and animal populations, etc. Are there other interpretations of the data I have seen? Possibly, but global warming can't be ruled out as one possibility. Do the changes prove beyond a shadow of a doubt that the changes are the result of anthropomorphic carbon emissions? Probably not, but anthropomorphic effects are a plausible contributor. If the changes are natural, will reducing man-made carbon emissions make any difference at all? It can't be proven, but since we do know that carbon dioxide has an atmospheric warming effect, it is possible that it might help. The stark reality is that, whether you are measuring carbon emissions or energy use, the largest contribution today comes from a small portion of the world's population. This has been the situation for a number of years because the countries that lacked energy largely lacked money as well, and therefore, couldn't buy or produce more energy. However, this situation is on the verge of changing rapidly. Two very populous countries, China and India, are becoming economic powerhouses and are now beginning to increase their energy use. China has already surpassed the United States as the world's biggest carbon emitter. Yet, they still use only a fraction of the energy per capita that we do. Therefore, their energy use--and carbon emissions--are likely to increase a lot more. A large fraction of India's population still has no access at all to electricity. Therefore, the potential increase in energy use in India is staggering. There is still further potential for increased demand from other parts of the world, particularly Africa. These may develop more slowly, because most other less-developed countries do not yet have the economic clout that China and India now have, but the potential is surely there. Therefore, I have to wonder: Even if we believe that current levels of carbon emissions have little or no effect, are we sure that several times the current levels of emissions will still have no effect? One of the main objections to taking measures to reduce global warming is that such measures will increase the cost of energy and that the increased cost will have an effect on our economy. I again risk straying into a field outside my own--this time, economics--but it seems very clear that the increased demand in China, India and perhaps elsewhere is already beginning to create pressures on the supply of energy (and other) resources. Couple to this the fact that much of the world's oil comes from a politically unstable part of the world, and that countries controlling scarce resources have been known to use threats to the supply as a weapon. The increased demand for these resources, and the expectation of dwindling supplies of oil and gas, could make it easier for such countries to invoke threats of embargoes in the future. In my view, all of this means that the Copenhagen conference is about much more than stemming global warming. It is at least as much about finding ways to address the growing demand for energy around the world. It is about the recognition that our energy use has consequences, and that a coordinated international plan can help meet the needs and manage the consequences. Does this mean that we may have to make commitments at Copenhagen that will increase the costs of energy for us in the future? Possibly, but the increase in cost may, in the long run, be less than the price we will pay for business as usual. Therefore, I think it behooves us to engage in this discussion thinking not only of the global warming issue, but also of the issue of how the world is going to be fueled in the decades ahead, and the role of the developed countries in shaping the energy future. Global warming should be one consideration in the decision process, but so should adequacy and diversity of supply, sustainability, and a variety of other considerations. All options should be on the table, including carbon sequestration and new transportation fuels, renewables and nuclear energy, conservation and efficiency. All countries should participate, each according to its history, its economy and its current energy use. Footnote: This post was originally published earlier in the Copenhagen conference. I edited it slightly a day or two later and mistakenly, did not republish it. Unfortunately, it may be a little dated now, but I hope it is still useful. I apologize for any inconvenience. I don't know if it was the L-tryptophan in the turkey, the wine I drank with it, or the fact that I was on the road or with family most of the past week, but somehow I could not muster the time or energy to post something during the Thanksgiving holiday. So on the theory "better late than never," I thought I'd share some thoughts that were inspired by the bountiful holiday table and the true intent and spirit of the holiday, which, believe it or not, is not to overdose on turkey and stuffing! Rather, it is to reflect on what we have to be thankful for. While this is ordinarily a very personal and private reflection for me, this year, it seems to me there are some thoughts that I must have in common with a lot of my professional colleagues. For me, what we have to be thankful for is how much better our lives are than the lives of people in the days of the Pilgrims. In the 1600s, life was tough. A summer's yield from local farms could be wiped out by droughts, or insects, or fires, and a long, cold winter could lead to starvation. Water for everyday needs had to be hauled from streams or town wells. Disease was rampant. Homes were cold in the winter and hot in the summer. All of life's basic needs--food, water, firewood--required long hours of hard labor. The Pilgrims who came to the shores of the New World never again saw or spoke to the families and friends they left behind. Even letters were infrequent. The great chasm created by the Atlantic Ocean largely remained until almost modern times. My own ancestors, who came to the US about a hundred years ago, never returned again to the lands from which they had come. And it did not take an ocean to separate people. Early settlers who traveled more than a few hundred miles seldom, if ever, saw their families again. How much different life is today! Advanced technologies, including energy technologies, help assure an adequate supply of food and water, of heat and electricity, of transportation and telecommunications. They have given us more freedom, comfort, and pleasure. They allowed me to travel hundreds of miles to be with family for a few days, and permitted us to enjoy a dinner with ingredients that came from many places. While I am thankful for these things, I recognize that there are still problems. The comforts we enjoy are using up resources and dirtying the environment too fast and too much, and are not yet shared by all the world's people. But another thing for which I am thankful is the ingenuity and creativity humankind. When I think of the profound changes in the way we live that have been accomplished in just a few hundred years, and the rapid pace at which they have changed even in my lifetime, I am confident that we can address the problems we face. The same creativity and ingenuity that led to automobiles and airplanes, telephones and television, computers and the Internet, satellites and nuclear power plants can surely improve on these same technologies. That same creativity and ingenuity can invent cleaner transportation fuels and electric power plants, smarter electrical grids, more efficient appliances, and technologies that are accessible to the developing world. I realize that is a tall order. Not every technological development is successful, replacing existing systems is costly and takes time, and we sometimes find that fixing one problem makes another worse. Nevertheless, I am confident that we scientists and engineers have the capability to find solutions. It is therefore my hope that, some future Thanksgiving, my reflections will look back on today in wonder at how much further we will have come.